Too many children are being incorrectly diagnosed with asthma, with inhalers being dispensed for no good reason and becoming almost "fashion accessories", say two specialists in the illness. Prof Andrew Bush and Dr Louise Fleming warn that although steroid inhalers are life-saving when used properly, their side-effects should not be ignored. And they call for more objective, careful diagnoses. Meanwhile charity Asthma UK says better tests are urgently needed. 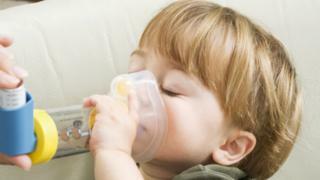 In the UK, about 5.4 million people currently receive treatment for asthma - 1.1 million of whom are children. Writing in the journal Archives of Disease in Childhood, the two respiratory doctors from Imperial College and the Royal Brompton Hospital in London acknowledge that asthma can be a fatal condition that was once not being diagnosed enough. They argue the pendulum has now swung too far the other way - with over-diagnosis resulting in some people seeing asthma as a trivial matter and overlooking the potential it has to kill. Doctors currently use guidelines to help work out if someone has the condition but making a diagnosis can be difficult as there is no definitive test. The article says doctors should think very carefully about each diagnosis they make and consider the use of more objective and sometimes more invasive checks - such as testing nitrogen oxide levels and blood tests - if they are unsure. And if a child is not getting better despite asthma medication then, instead of increasing doses automatically, they add that the possibility that the diagnosis might not be correct should be considered. The paper also urges medics to remember that many children outgrow their symptoms and says they should check diagnoses over time to ensure they are still relevant. New National Institute for Health and Care Excellence (NICE) guidelines for England, which are now out for consultation before final approval, say doctors should use more clinical tests to back up their judgement and avoid the danger of wrongly labelling someone as having asthma. Prof Mark Baker of NICE said: "Accurate diagnosis of asthma has been a significant problem which means that people may be wrongly diagnosed or cases might be missed in others." Meanwhile the charity Asthma UK said more funds need to be put towards the research and development of a definitive test for the condition. The charity's Dr Samantha Walker added: "It is astonishing in the 21st century that there isn't a test your child can take to tell if they definitely have asthma. "Asthma isn't one condition but many, with different causes and triggered by different things at different ages. Asthma symptoms also change throughout someone's life or even week-by-week and day-by-day. "This complexity means that it is both over and under-diagnosed, in children and in adults, so people don't get the care they need to manage their asthma effectively. "As a result, a child is admitted to hospital every 20 minutes because of an asthma attack and asthma attacks still kill the equivalent of a classroom of children every year in the UK." Dr Martin Allen, a lung specialist and member of the British Thoracic Society, said: "The key message for patients is that they should carry on taking their medication as prescribed.